The band’s new album, ‘High Crimes,’ is out April 26. "He was my guitar teacher," Ian says in new video interview with Gretsch. The set includes live tracks, studio outtakes, expanded liner notes and more. If you happen to be in the mood to hear Anthrax cover a classic song by Kansas, you're in luck. Last night, New York City's Webster Hall hosted the 2016 Epiphone Revolver Music Awards. The 2016 Epiphone Revolver Music Awards is live NOW! Check out the stream below. A riff-roaring, loudand unholy metallic takeover of New York City is on the horizon, as Revolver Magazine and Epiphonehave announced the 2016 Epiphone Revolver Music Awards. Anthrax have released a lyric video for “Breathing Lightning.” The song comes off their upcoming album, ‘For All Kings,’ due February 26 via Megaforce. A new Anthrax song, “Breathing Lightning,” is now available for streaming. 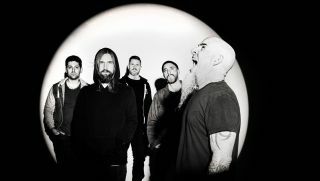 The song premiered on the BBC’s Radio 1 Rock Show; also included is a short interview with Anthrax guitarist Scott Ian. Limited tickets now available to exclusive live interview on Jan. 13, 2016, with thrash metal giants Anthrax discussing their upcoming 11th studio album, For All Kings.